Get ready for the summer of Syfy. TVInsider reports the second seasons of Killjoys and Dark Matter will premiere in July. Both series ended their freshman season last August. 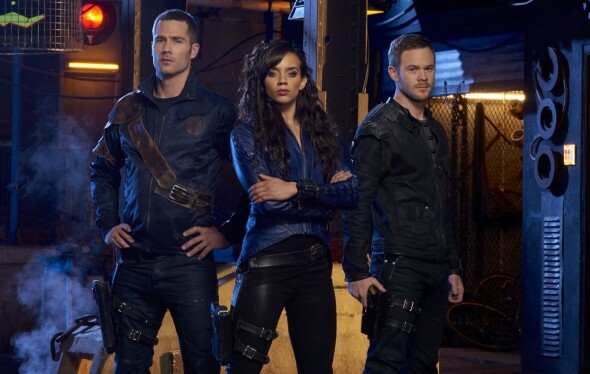 Season two of Killjoys kicks off when “Dutch (Hannah John-Kamen), Johnny (Aaron Ashmore) and D’avin (Luke MacFarlane) attempt to uncover Khlyen’s (Rob Stewart) secrets—which is complicated by the fact that he was formerly Dutch’s mentor. As dangerous as the Quad’s criminals are, the trio realize the biggest threat could be within the Reclamation Apprehension Coalition.” The new season premieres on July 1st at 9 p.m. ET/PT. The second season of Dark Matter finds the crew of the Raza becoming entangled in an “intergalactic conspiracy, as they search for a device that could prove vital in the upcoming war.” Marc Bendavid, Melissa O’Neil, Anthony Lemke, Alex Mallari Jr., Jodelle Ferland, Roger Cross, and Zoie Palmer star. Season two premieres on July 1st at 10 p.m. ET/PT. Additionally, season one of Dark Matter will be released on DVD on June 14th. What do you think? Do you watch either Killjoys or Dark Matter? Will you watch season two? More about: Dark Matter, Dark Matter: canceled or renewed?, Killjoys, Killjoys: canceled or renewed?, Syfy TV shows: canceled or renewed? Dark Matter is great. Looking forward to season 2. Delighted both shows are great! Looking forward to both dark matter and killjoys return. Intriguing storylines and developing characters are worth the wait. Can’t wait until July! Friday is a perfect time and day to air, there is nothing else on tv. Awesome news. I love both shows.